The search and rescue operation for a Cardiff-bound plane that went missing with footballer Emiliano Sala on board has resumed. Police say they are focussing on the possibility that Sala is on a life raft with his pilot somewhere in the English Channel. They admit the pair could also be at sea or have been picked up by a passing ship. Sala, Cardiff City's record signing, was on the private plane when it disappeared off the northern coast of France on Monday evening. CEO Ken Choo said the Premier League club was "very shocked" to hear the plane had gone missing. 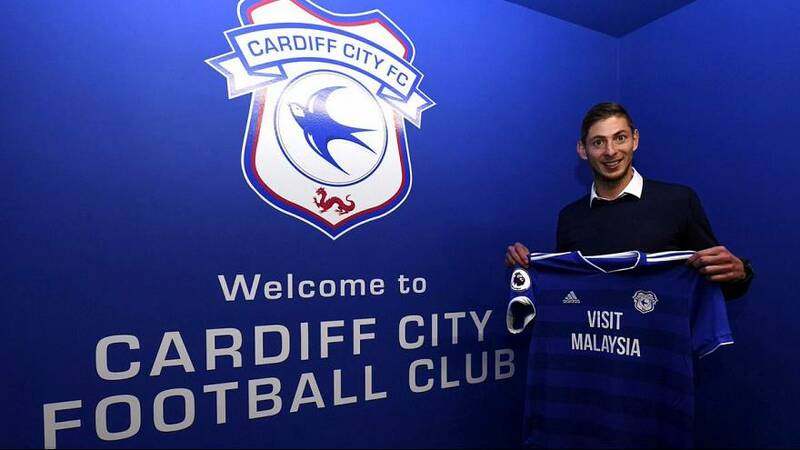 Argentine striker Sala had been announced as Cardiff's latest recruit over the weekend and was flying to Wales to begin a new chapter in his career. "We expected Emiliano to arrive last night (Monday) into Cardiff and today (Tuesday) was due to be his first day with the team," he said. "All of us at Cardiff City FC would like to thank our fans and the entire footballing family for their support at this difficult time. Guernsey Police released a map showing the area that had been already searched. In an interview with Argentine broadcaster C5N, Sala's father Horacio said he found out about the incident through a friend that had seen the story on television. "I didn’t know anything because I’m away from home, I’m a truck driver," he said. "I'm in despair." 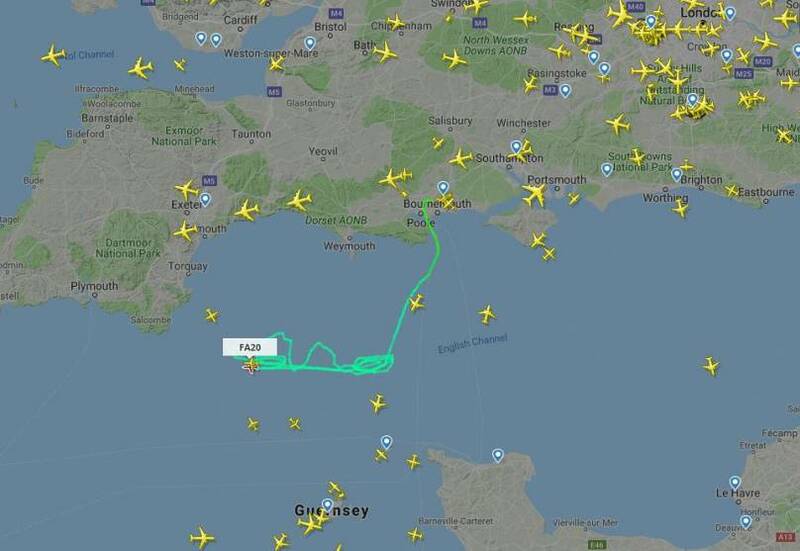 Guernsey Police say they are still searching for the PA 46 Malibu aircraft, which was travelling from Nantes to Cardiff when it disappeared from radar with 28-year-old striker Sala and one other person on board. Guernsey Police said two planes, two helicopters and a lifeboat were searching for the missing aircraft on Tuesday afternoon, but that "no trace has yet been found." "Conditions during the search last night were challenging, with wave heights of up to two metres, with heavy rain showers and poor visibility," Guernsey Police said on Twitter. "Today the sea is much calmer, although visibility was good, it is now deteriorating." It added that a decision would be made at sunset on an overnight search. Map data from the flightradar24 website showed rescue aircraft searching the English Channel late on Tuesday morning. Spencer Birns, commercial director at Cardiff Airport, said: "We can confirm that a light aircraft due to arrive in Cardiff from Nantes at 2045 last night (Monday 21st January) did not arrive as planned. "We are in close contact with the Air Accident Investigation Branch (AAIB) and will continue to assist with their enquiries in any way we can." Argentine striker Sala was revealed as Premier League team Cardiff City’s record signing on Saturday. Sala posted a picture on Twitter on Monday afternoon of him saying goodbye to his Nantes FC teammates. The French Football Federation said Nantes' French cup game on Wednesday had been postponed because of the plane's disappearance. A statement from Cardiff City chairman Mehmet Dalman read: "We are very concerned by the latest news that a light aircraft lost contact over the Channel last night." John Fitzgerald, the chief officer of Channel Islands Air Search, told Euronews about how the search efforts are developing. Fitzgerald said his teams were called out at around 8.30 p.m. on Tuesday (9.30 p.m. CET) by Jersey air traffic control, saying an aircraft had gone down. Describing the sea conditions where the plane was believed to have fallen, he said: "There's an area of water called 'the race', which is well named because of the way the tide flows through there. They can flow at six or seven knots, which mean if you're in the water you can be six or seven miles away from where you went in after about an hour." "The sea conditions are fairly rough — well, they were rough last night and there were wintry showers. It's calmed down quite a bit this morning, making the search area a lot easier to work with," he added. Fitzgerald noted that the plane disappeared at 2,000 feet, meaning it "could have stayed airborne for another five or six miles before it came down on the water." "Whether it was a controlled landing, we don't know. So we don't know whether we're looking for life rafts, we're looking for people in the water with life jackets, or we're looking for wreckage — only time will tell." An outpouring of support from the sporting community followed confirmation of Sala's presence on the missing plane. French-Moroccan footballer Amine Harit, who played alongside Sala at Nantes FC before moving to Germany's Schalke 04, simply tweeted: "Emi..." with a several emojis. AC Milan player Tiemoué Bakayoko tweeted "we are Emiliano Sala. May God bring you back to us," before following up with a second tweet sending best wishes to the as-yet unidentified pilot. Sala's former team Chamois Niortais FC also tweeted its disbelief. "Tell us it's a joke...Emi...All #TeamChamois think of you." US Orleans, another of Sala's former teams, said it had heard the "sad news," before sending a message of support to the relatives of both passengers on the flight. Former Nantes FC manager Sérgio Conceição tweeted a picture of himself with Sala, alongside a caption of hope. "A great player, a huge man," Conceição wrote. "Someone who gives everything, on the ground and in life. Incredible dedication and determination." "If miracles exist, I would ask for one now."